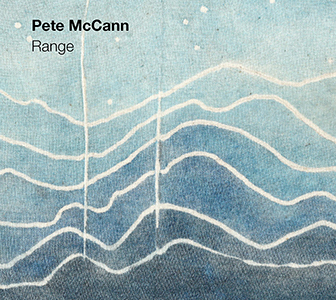 A FIRST LISTEN to the sparkling jazz-rock of guitarist Pete McCann may leave you pondering why, at least in the UK, his name is so unfamiliar. Respected as a first-call sideman on the New York scene, he has appeared on over 80 album recordings including those of Patti Austin, Curtis Stigers and the Mahavishnu Project; while in jazz his credentials include having worked alongside Kenny Wheeler, Dave Liebman, Lee Konitz and Brian Blade. US guitarist Joel Harrison is not the kind of guy to become entrenched in one particular musical niche – in fact, his extensive back catalogue of recordings (probably lesser known to European ears) reveals a desire to straddle genre borders to communicate his searching creativity. Harrison’s collaboration with sarode player Anupam Shobhakar (Leave the Door Open, Whirlwind, 2013) conveyed an intelligent and empathetic appreciation of North Indian and other world music, ingeniously fusing it with jazz and rock elements; and previous albums reveal an embracement of African, Appalachian, country music and spirituals (to name but a few), as well as the clear influence of American jazz and country guitarists such as Bill Frisell and Duane Allman. This new release release presents a fascinating quintet line-up – guitar, trumpet, bassoon, bass and drums – in an improvisationally-heavy exploration of originals by Harrison, plus one arrangement. The guitarist explains that a Spirit House, in East Asian culture, is a miniature structure sheltering the deities, “a home of sorts for those invisible forces that guide the visible world” – and hence a useful metaphor for the studio coming-together, following a West Coast tour, of esteemed musical spirits Harrison, Cuong Vu, Paul Hanson, Kermit Driscoll and Brian Blade. With such collective experience, Spirit House projects a huge vista of powerful styles and atmospheres centred around contemporary jazz and rock, with an instrumental/electronic weave which, at times, is pleasingly difficult to unpick. Title track An Elephant in Igor’s Yard is typical of the energy to be found here, it’s dark, swirling mood underpinned by clashing, overdriven guitar chords and a solid, persistent bass’n’drum pulse; yet there is space within for trumpeter Cuong Vu to blast high into the roof… and is that footloose pitch-bent synth actually a remarkable electronic transformation of Paul Hanson’s bassoon? The attractive, relatively acoustic feel of Old Friends is inhabited by a playful whiff of mid-’70s prog/psychedelia (mostly thanks to its jaunty, almost Hendrix-fashioned bassoon melodies), as is the tumbling Left Hook, where guitar, trumpet and bassoon superbly combine as a smooth, pseudo horn section before Vu delivers the most impressively extreme range of techniques. Paul Motian’s Johnny Broken Wing drifts freely and emotionally in Harrison’s guitar-and-effects arrangement, the plaintive unison melody carried serenely by Vu and Hanson; and that melancholy aura filters in to the leader’s translation of his own early 90s poem, Some Thoughts on Kenny Kirkland – a tribute, led by soulful vocalist Everett Bradley and Harrison’s ‘Free Bird’ guitar, to those who have departed too soon. The chattering lightness of You Must Go Through a Winter is carefully measured, leaving a broad canvas over which trumpet, guitar and oboe glide effortlessly – a levitational oasis amongst the heavier numbers; and bluesy Sacred Love increasingly bustles to Kermit Driscoll’s grooving bass as trumpet and guitar grittily duel it out, joined by the new-age inquisitiveness of the bassoon (Hanson’s work a real stand-out). 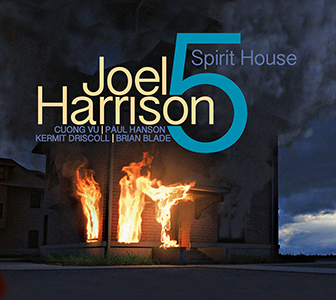 Eight-minute title track Spirit House cautiously ebbs and flows, Harrison’s sparse writing offering the intended freedom to his colleagues; and Look At Where You Are, featuring the leader’s layered vocals, closes the album in smoky, wistful, American folk-rock tones. Released on 7 July 2015, full details and purchasing options can be found at Whirlwind Recordings. 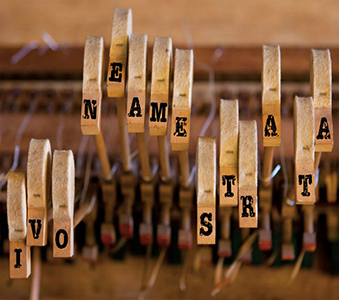 IVO NEAME is, without doubt, an effulgent beacon amongst British contemporary jazz pianists. Familiar as one third of much-lauded supergroup Phronesis, and cornerstone of both Adam Waldmann’s Kairos 4tet and Norwegian saxman Marius Neset’s projects, he is unsurprisingly much in demand as live performer and recording artist. 2012’s Yatra found Neame breaking out of these roles to interpret, in octet proportions, the excitement and intricacy of his distinctive, original compositions. Three years on, re-scaling to quintet format, new release Strata continues to reveal new layers of sound and texture through a challenging, saturated landscape of snappy arrangements and broadly extemporised freedom. From his previous album, Ivo reintroduces the solid musical personalities of tenorist Tori Freestone, vibraphone player Jim Hart, plus trusted drummer Dave Hamblett; and, adding to his own line-up of piano, synths and accordion, he also welcomes the considerable expertise of bassist Tom Farmer. Indeed, the strength of this sound world – far from any preconception of ‘jazz quintet’ – lies in the desire to explore new atmospheres, arising from strong concepts, through unfettered improvisational exposition and varying instrumental seams. Title track Strata illustrates this well, building from the simplest, dreamy piano motif set against a synth-led pulse until the richness of Tori Freestone’s tenor carries it skywards; and from thereon, the layers eloquently build, shift, then fade from view. Personality Clash feels wonderfully anarchic, with the pianist at his glorious, high-flying best against the elevated buoyancy of bass, drums and vibes – and Freestone’s characteristically forceful, wide vibrato searching is a joy. Ivo Neame cites early ’60s album ‘Coltrane plays the Blues’ as a classic – and OCD Blues, with Freestone’s brooding tenor motif, suggests something of the opening, pressing urgency of Coltrane’s ‘Mr Knight’. At almost ten minutes’ duration, it traverses many planes; sometimes hitting Genesis-like prog grandeur, then flying like the wind through rippling conversations between Neame and Hart, or stratospherically drifting to bowed vibes, sustained accordion and shimmering percussion. Miss Piggy leans more towards Neame’s work with Kairos 4tet, the measured, falling ballad firmly led by Freestone’s known ability to endlessly pour out line after line of beauteous melody. Breathtakingly complex, Crise de Nerfs jitters to the engaging delirium of Tori Freestone’s flute and Jim Hart’s dizzying vibes display. Alongside Farmer and Hamblett, Neame is more the rhythm-maker here, as well as adding chordal colour… and a fabulous ritenuto again changes the landscape before a final flourish. Piano trio Eastern Chant embodies the spirit of Phronesis, heightened by the swinging, rising bass phrases of Tom Farmer – a great showcase for Ivo Neame’s pianistic creativity. Flute and accordion in Folk Song are hypnotically redolent of Marius Neset’s Scandinavian-wrought jazz, including a chirpy tenor-and-vibes interlude; and, finally, a pictorialisation of Snowfall is magically realised through the particularly delicate, spacial interaction of these five players. A towering statement from a venturesome British team, Strata is available from Whirlwind – further information, promo video and purchasing options here. And take a look at the entertaining title track video! 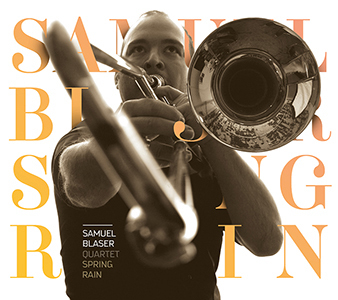 SWISS TROMBONIST Samuel Blaser has a strong aspiration to further expand the scope of his instrument, unconfined from the worlds of jazz and free improvisation, through this new release of quartet material in tribute to American clarinettist and composer Jimmy Giuffre. THE THREE MASKED MEN were spotted last year on a visit to one of Phil Robson’s favourite UK haunts – the Players Theatre, Davenham, Cheshire. In its most intimate of surroundings, the guitarist and his colleagues (sans disguise!) entertained a rapt audience with new music destined for this debut organ trio release, The Cut Off Point. Small venue, big vibe. 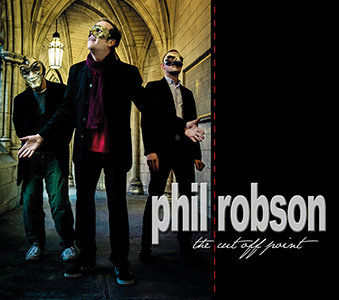 An influential figure on the British contemporary jazz scene (and one quarter of seminal jazz/rockers Partisans), Phil Robson has long been a fan of the organ trio – and, citing Pat Martino and Wes Montgomery amongst his influences, he has harboured a desire to write and perform in this format. As with any trio, the exposure requires nerve and intuition to ignite the creative spark… oh, and the opportunity to work with seasoned pros – in Robson’s case, here, with Ross Stanley (Hammond organ) and Gene Calderazzo (drums). The impact of the organ trio is instant. Without bass or piano, it’s the huge physical and audible presence of the Hammond B-3 that takes centre stage – and Ross Stanley’s is as authentic as they come, complete with separate, whirring tone cabinet. Robson and drummer Calderazzo go back many years, especially through their work with Partisans, and therefore have a ready-made connection which is clearly evident. With seven of the eight tracks penned by Robson, his opener, Thief, reveals the classic organ trio groove – guitar and keyboard melodies deftly gryrating and intertwining, buoyed by Calderazzo’s irresistible, carefully-weighted, toe-tapping rhythms; and with Stanley in charge of pedal-board bass, the organ-and-guitar flexibility of combining or alternating sustained chordal colour with brisk upfront soloing is a great feature, captured particularly well in bustling Second Thoughts. The trio’s retro interpretation of David Liebman’s Dimi and the Blue Men bleeps and echoes in hyperspace before landing on craggy Jeff Beck terrain, Calderazzo particularly eloquent in his snare detail. Snappy organ and guitar lines are shared in Vintage Vista, its rapid intensity inviting terrific soloing all round (again, its Calderazzo that steals the show – how I’d love to hear that drum track in isolation!). Dedicated to the late Kenny Wheeler, Astral‘s floating, undulating soundworld is redolent of Zawinul’s In a Silent Way and Metheny’s Sirabhorn, whilst pleasingly jarring title track The Cut Off Point buzzes to Robson’s hard-edged, John Scofield-like effects and restless group improvisation. One of Robson’s older, unrecorded tunes, Berlin, swings airily to his light and apparently effortless exploration of the fingerboard; and, to finish, Ming the Merciless deep-grooves to crunchy guitar’n’Hammond chords and infectious bluesy soloing. As ‘Ratzo’ shouts at the close, “We got an album”. Yep, they sure have! The Cut Off Point is released by Whirlwind on 18 May 2015 – further information, audio samples and purchasing can be found here. 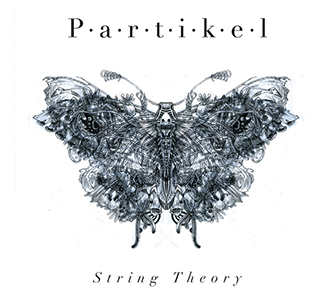 WITH A THRASHING RIFF worthy of Jimmy Page, chordless trio Partikel announce their boldest statement yet in new release String Theory – a collaboration with a dynamic string quartet led by violinist Benet McLean. Originally formed for Monday night jam sessions on the London jazz circuit, Partikel – Duncan Eagles (saxes), Max Luthert (double bass) and Eric Ford (drums) – have established themselves over the past few years with regular gigging, resulting in two previous albums (eponymous debut Partikel and 2012’s Cohesion). Now, further extending their possibilities with strings, that initial Led Zep-fuelled outpouring dramatically signals their renewed intent in a 12-track programme mostly composed and arranged by saxophonist Eagles. Three-part Clash of the Titans reveals the augmented band’s creative process, the arrangements described as being “almost exclusively conceived on the bandstand… spontaneous musical exchanges that flowed from the heat of performance have been added to the compositions.” And that sense of discovery makes for an absorbing listen. Following the heavily rocking intro, the ‘concerto’ develops into atmospheres in which the string quartet becomes an integral part – certainly no grotesque, strap-on afterthought – with Midnight Mass (part 3) irridescing to luscious sax improvisation and sumptuous strings. Shimmer‘s perky melodies are tossed about between sax and strings, buoyed by Eric Ford’s lively, creative percussion, until Benet McLean’s virtuosic solo violin introduces The Buffalo, a mesmerising, udu-accompanied episode with expansive, filmic qualities. Swinging an’ a-swaggering, Bartering with Bob is endearingly confident and as high-spirited as a rollicking old standard (like Monk without piano! ), Eagles responding articulately to the temerarious bass and drums of Luthert and Ford; and in the graceful meandering of The River, the string quartet’s eloquence and empathy with the Partikel trio is beautifully captured – here in particular, Eagles’ soprano impresses with Coltranesque abandon and invention. Smouldering Wray Common softly grooves to udu, bass and smooth tenor, with fabulously expressive strings; and Eagles’ alchemistic tenor reading of Johnny Green’s familiar Body and Soul intertwines effectively with Matthew Sharp’s emotive cello and the Kronos-like spikiness of the quartet as a whole, all adorned by Ford’s elaborate percussion. Partikel ‘laid bare’ is as immediate as ever in Cover, soprano, bass and drums weaving their spell with customary vivacity; and searing string glissandi add verve to closing number The Landing, Eagles’ tenor wildly jitterbugging to Luthert’s and Ford’s rapid animation. As a trio, Partikel have clearly become stronger, unafraid to venture into the unknown, and looking to develop their musical journey with both spontaneity and bravura. Released by Whirlwind on 11 May 2015, further information, promo video and purchasing can be found at the dedicated String Theory web page. Overflowing with writhing, jostling spontaneity, but with sufficient compositional structure to keep a lid on things, London-based saxophonist George Crowley’s new two-tenor quintet recording is a veritable powerhouse of creativity. His debut release, Paper Universe (Whirlwind, 2011), remains long in the memory as a jazz quartet recording of mature, unfettered exploration. Now, together with sparring tenor partner, the ever-chipper Tom Challenger, he constructs the formidable and foreceful front line of an energetic five-piece completed by Dan Nicholls (piano/Wurlitzer), Sam Lasserson (double bass) and Jon Scott (drums). 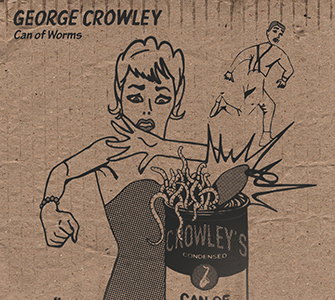 Crowley reveals that this band came into being for the purposes of a 2013 live gig, leading to the desire to develop and document the project’s clear success in a studio album – a shrewd and worthwhile decision, given the resulting sense of excitement, anarchy and strong musicality on show here. As composer of all seven substantial pieces, the leader never settles for the obvious, nor any half measures – he and his colleagues go all out for unwavering improvisation whilst recognising the strength of tight ensemble playing. And it’s fabulously earthy, ‘unputdownable’ stuff. The Opener‘s agitated ten-minute expanse bristles to Jon Scott’s trademark clattering-yet-incisive drum rhythms, bolstered by Sam Lasserson’s babbling bass and Dan Nicholls’ typically brash, animated piano; and in amongst all this, tenorists Crowley and Challenger (one in each ear!) breathlessly duel it out – the combination of the written and the abstract quite thrilling. Nicholls’ uneasy ‘music box’ Wurlitzer announces Whirl, a broad, impudent affair featuring Challenger’s gruffness and Crowley’s screeching – yet the precise framework is always apparent. Ubiquitous Up Tune in 3, with tricksily-timed sax riffs, is certainly ‘up’, and it’s a tribute to the directness of the engineering/mixing that its raw, live feel translates so well into recorded sound. The jarring major/minor blues of Rum Paunch is a joy, the two tenors either in unison (or thereabouts) or otherwise taunting each other, whilst Nicholls’ sneering, rippling piano almost encourages them in their outrageous discord. Hard-swinging but nevertheless anarchic I’m Not Here To Reinvent The Wheel rolls deliciously to Lasserson and Scott’s fast pace, the reedsmen clearly revelling in its abandon (confirmed by the group cackles that follow its abrupt finish!). Terminal shuffles mysteriously to Scott’s intricacy at the kit and Nicholls’ magnificent Wurlitzer weavings, Lasserson’s relentless bass underpinning the broadness of the tenors’ extemporisations – such a glorious (and at times, cheeky) sound world; and, to close, T-Leaf rumbles particularly freely, though the fractured improvisations finally come together in absolute unanimity… lid well and truly sealed! A triumph for George Crowley and his team. Released on 23 March 2015, further information, audio samples, promo video and purchasing can be found at Whirlwind. ALBUM REVIEWS are currently only periodically selected at and written for publication on the LondonJazz News website and also referenced here (further information). NEWS AND VIEWS on album releases and other music-related activities (including #recentlistening) continue here and at Twitter (@AdrianPallant).